You are bidding on this fantastic Connor McDavid rookie year card set. As one of the biggest names in hockey, Connor McDavid is no stranger to the hobby. 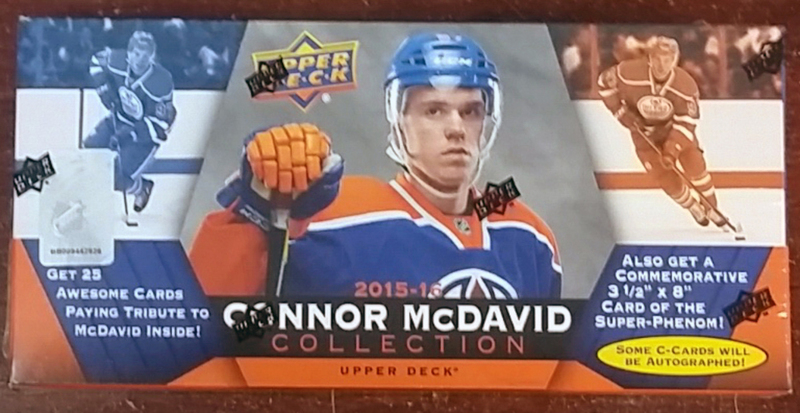 Building on his growing supply of hockey cards, the young star is the main focus of the 2015-16 Upper Deck Connor McDavid Collection Hockey box set. The factory set includes 25 Connor McDavid base cards that chronicle his budding career, including his NHL Draft day, Team Canada participation and his NHL debut. In addition to the base set, there is also one Commemorative C-Card insert in each box. These over-sized cards measure 3 1/2 inch by 8 inch. A great addition to any collection!